COLLEGE PARK, Md. – Why does a mouse's heart beat about the same number of times in its lifetime as an elephant's, although the mouse lives about a year, while an elephant sees 70 winters come and go? Why do small plants and animals mature faster than large ones? Why has nature chosen such radically different forms as the loose-limbed beauty of a flowering tree and the fearful symmetry of a tiger? These questions have puzzled life scientists since ancient times. Now an interdisciplinary team of researchers from the University of Maryland and the University of Padua in Italy propose a thought-provoking answer based on a famous mathematical formula that has been accepted as true for generations, but never fully understood. In a paper published the week of Feb. 17, 2014 in the Proceedings of the National Academy of Sciences, the team offers a re-thinking of the formula known as Kleiber's Law. Seeing this formula as a mathematical expression of an evolutionary fact, the team suggests that plants' and animals' widely different forms evolved in parallel, as ideal ways to solve the problem of how to use energy efficiently. If you studied biology in high school or college, odds are you memorized Kleiber's Law: metabolism equals mass to the three-quarter power. This formula, one of the few widely held tenets in biology, shows that as living things get larger, their metabolisms and their life spans increase at predictable rates. Named after the Swiss biologist Max Kleiber who formulated it in the 1930s, the law fits observations on everything from animals' energy intake to the number of young they bear. It's used to calculate the correct human dosage of a medicine tested on mice, among many other things. But why does Kleiber's Law hold true? Generations of scientists have hunted unsuccessfully for a simple, convincing explanation. In this new paper, the researchers propose that the shapes of both plants and animals evolved in response to the same mathematical and physical principles. By working through the logic underlying Kleiber's mathematical formula, and applying it separately to the geometry of plants and animals, the team was able to explain decades worth of real-world observations. "Plant and animal geometries have evolved more or less in parallel," said UMD botanist Todd Cooke. "The earliest plants and animals had simple and quite different bodies, but natural selection has acted on the two groups so the geometries of modern trees and animals are, remarkably, displaying equivalent energy efficiencies. They are both equally fit. And that is what Kleiber's Law is showing us." Picture two organisms: a tree and a tiger. In evolutionary terms, the tree has the easier task: convert sunlight to energy and move it within a body that more or less stays put. To make that task as efficient as possible, the tree has evolved a branching shape with many surfaces – its leaves. "The tree's surface area and the volume of space it occupies are nearly the same," said physicist Jayanth Banavar, dean of the UMD College of Computer, Mathematical, and Natural Sciences. "The tree's nutrients flow at a constant speed, regardless of its size." With these variables, the team calculated the relationship between the mass of different tree species and their metabolisms, and found that the relationship conformed to Kleiber's Law. To nourish its mass, an animal needs fuel. Burning that fuel generates heat. The animal has to find a way to get rid of excess body heat. The obvious way is surface cooling. 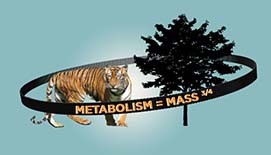 But because the tiger's surface area is proportionally smaller than its mass, the surface is not up to the task. The creature's hide would get blazing hot, and its coat might burst into flames. So as animals get larger in size, their metabolism must increase at a slower rate than their volume, or they would not be able to get rid of the excess heat. If the surface area were the only thing that mattered, an animal's metabolism would increase as its size increased, at the rate of its mass to the two-thirds power. But Kleiber's Law, backed by many sets of observations, says the actual rate is mass to the three-quarters power. Clearly there's a missing factor, and scientists have pored over the data in an attempt to find out what it is. Some have proposed that the missing part of the equation has to do with the space occupied by internal organs. Others have focused on the fractal, or branching, form that is common to tree limbs and animals' blood vessels, but added in new assumptions about the volume of fluids contained in those fractal networks. The UMD and University of Padua researchers argue a crucial variable has been overlooked: the speed at which nutrients are carried throughout the animals' bodies and heat is carried away. So the team members calculated the rate at which animals' hearts pump blood and found that the velocity of blood flow was equal to the animals' mass to the one-twelfth power. "The information was there all along, but its significance had been overlooked," said hydrologist Andrea Rinaldo of Italy's University of Padua and Switzerland's Ecole Polytechnique Federale. "Animals need to adjust the flow of nutrients and heat as their mass changes to maintain the greatest possible energy efficiency. That is why animals need a pump – a heart – and trees do not." Plugging that information into their equation, the researchers found they had attained a complete explanation for Kleiber's Law. "An elegant answer sometimes is the right one, and there's an elegance to this in the sense that it uses very simple geometric arguments," said physicist Amos Maritan of the University of Padua. "It doesn't call for any specialized structures. It has very few preconditions. You have these two lineages, plants and animals, that are very different and they arrive at the same conclusion. That is what's called convergent evolution, and the stunning result is that it's being driven by the underlying physics and the underlying math."